Antimony is a chemical element. It has the chemical symbol Sb. The symbol Sb is from the Latin name of 'stibium' for the element. It has the atomic number 51. Its atomic mass is 121.8. It is a blue-gray element that is somewhat toxic. Antimony has four allotropes. The common allotrope of antimony is a blue-white metalloid. It looks black when powdered. It is brittle, soft, and shiny. Yellow and black antimony are unstable nonmetals. Yellow antimony is only found at very cold temperatures. It is made by oxidation of stibine. It turns into black antimony when light is shined on it or when it is warmer. Black antimony is normally made by heating metallic antimony until it boils and then cooling the vapors very quickly. It can ignite spontaneously (without any ignition source like a spark or a flame). It also corrodes easily. There is another explosive form of antimony that is made by electrolysis of antimony trichloride. This antimony explodes when changing into the metallic form. There is no chemical reaction; the atoms in the antimony crystal are rearranging themselves. When antimony is talked about it normally means the blue-white metalloid form, since it is most common. Antimony is a rather unreactive element. It does not dissolve in acids easily. It can dissolve in oxidizing acids like nitric or sulfuric acid. It does not corrode easily in air, although the black allotrope can corrode. Antimony burns in air to make antimony trioxide. In excess air, it burns to antimony tetroxide. Antimony forms chemical compounds in three oxidation states: -3, +3, and +5. -3 compounds are called antimonides. They are made by reacting antimony with other metals. They react with acids to make the toxic and unstable gas stibine. +3 compounds are the most common. They are weak oxidizing agents. They are somewhat covalent, having low melting points. Antimony trichloride is a colorless and soft solid that has a strong odor. Antimony trioxide is a white solid that dissolves a little in water. The other antimony(III) halides all react with water except for antimony trifluoride. +5 compounds are strong oxidizing agents. Antimony pentafluoride is highly reactive, as well as antimony pentoxide. -3 compounds are reducing agents. The antimonides have properties between alloys and salts. +3 compounds are weak oxidizing agents. They are covalent. Most of them are colorless or light yellow solids. They are the most common antimony compounds. Antimony tetroxide has antimony in both its +3 and +5 oxidation state. +5 compounds are strong oxidizing agents. They are rare. Antimony sulfide was known for a long time. Some things plated with antimony and made out of antimony were found in Egypt and Chaldea. The first time antimony was mentioned in Europe was in the 1540. The first native antimony was found in Sweden in 1783. Antimony sulfide and antimony were confused sometimes in antiquity. There is a question over what "stibium", the original name of antimony, meant. Antimony is not common. It is found about as often as thallium. It is quite easy to get, though and is in many minerals. Antimony is sometimes found as an element, but normally it is found as stibnite, an antimony sulfide mineral. 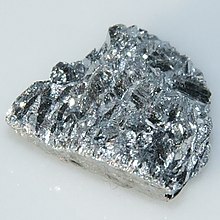 Stibnite is the main ore of antimony. China is the biggest maker of antimony; it makes 84% of all antimony. Other countries that make antimony are South Africa, Bolivia, and Tajikistan. Antimony is not used in the human body. Antimony is made from stibnite by heating it with air. This makes antimony trioxide. Since it gets so hot, the antimony trioxide is evaporated. Other metal oxides in the stibnite ore do not evaporate. The antimony trioxide gas is condensed in a container. The antimony trioxide is then heated with carbon to make carbon dioxide and antimony. Another way to make antimony is to heat stibnite with scrap iron. This makes iron(II) sulfide and antimony. The antimony is separated and used. About half of all antimony is used to make antimony trioxide for flame proofing. It makes an alloy with lead. This alloy, 5% antimony and 95% lead, is harder than pure lead. It is used in lead acid batteries, as well as some other things. It is used as an alloy with lead in the pipes of pipe organs. Pewter has antimony in it. Some lead-free solder has antimony in it. It is used as an alloy with lead in ammunition for small arms and in covering of cables as well. It is also used in some alloys that have very little friction like Babbitt metal. Another use is in a catalyst for making some plastics. Antimony(III) oxide is added to some glass to remove bubbles for things like television screens. Antimony is used as a dopant in electronics. Some antimony compounds were used as medicines to kill protozoans. The antimony pill was a chunk of antimony that was supposed to heal diseases. It is used in medicines for pets. Antimony sulfide is used in matches. Antimony is toxic. Its toxicity is similar to arsenic, although it is less toxic than arsenic. Breathing in antimony dust can be very dangerous. Antimony reacts with strong oxidizing agents. Small amounts of antimony come out of plastic bottles where antimony was used as a catalyst. Some people were concerned that too much antimony was coming out. This page was last changed on 16 March 2019, at 21:45.